When moving in to our new house the first thing that became a concern for me was how we were going to get our mail. My worries went away when I was told that Canada Post would just redirect all of our mail to our new address which is good. We then started getting new mail after a few days. All went well except when we realized that our mail wasn't really safe as the mailman would just leave our mail at the door because we didn't have a wall mounted mailbox yet. All of our mail would be left in the front porch and we were afraid that the wind might blow our mail away or worst have someone stealing our private information. This is where our need for wall mount mailboxes started. With a mailbox you are ensured that your mail will be secured under a lock and key. I saw these mailboxes that looked like vaults so talk about extra security. You can also be assured that your mail will be received even when no one's home because some shipping company will never leave your package in front of your home unless they consider it safe to do so. Another reason that we wanted a mailbox is that it adds style and beauty to our home. There are a lot of styles and designs of mailboxes ranging from the classical mailbox design to those artsy modern mailboxes. I really liked the mailboxes at Mailboxixchange. They have a huge selection of residential and commercial mailboxes and you won't believe how reasonable their prices are. 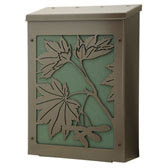 I especially liked this wall mount mailbox that had a maple leaf design. This design is fitting as it showed how much we love Canada. There were other awesome designs that caught my eyes too and they were just too beautiful to be used as a mailbox.